Years ago, when I first moved to Maui, there was a small sandwich shop called “Picnics” on Baldwin Avenue in a town called Paia. The shop still exists, but it has changed hands many, many times. At one point, back in the eighties, they had hired a professional baker (or so the rumor mill said) who had dropped out of the rat race, and had moved to Maui to windsurf. At that time, prior to a change in ownership and their subsequent decision to purchase baked good from Costco, all the pastries, breads, and muffins were made on the premises. 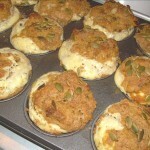 Everything was tasty, but there was one standout: Pumpkin Cream Cheese muffins. 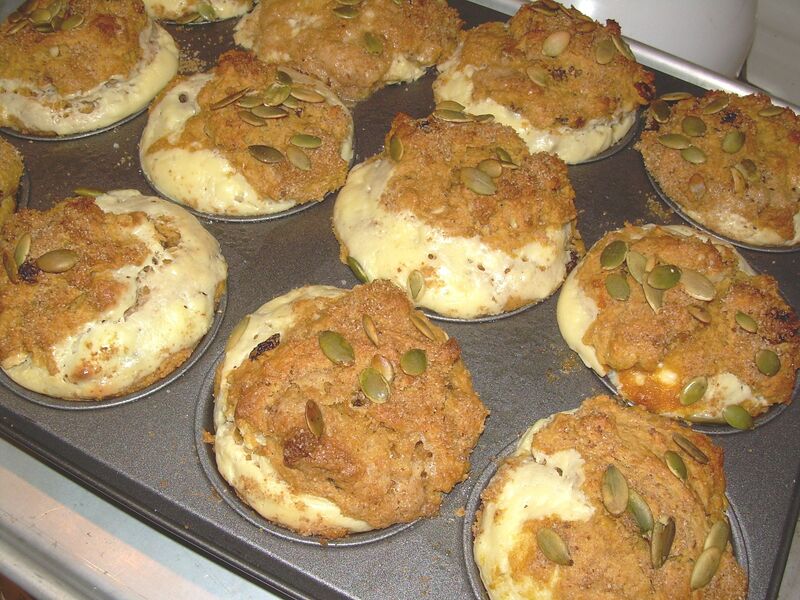 Now folks, these muffins were so good that people who hated pumkin, cream cheese, and/or walnuts would devour them. Once or twice a week, I’d run into Picnics (it had to be early or the muffins would be gone by 10:00 a.m.) and buy one, then I’d go sit outside the post office, under the palm trees, and slowly nibble around the edges of the muffin. I would work around the perimeter until finally only the sweet cream cheese filling was left, whereupon I’d stuff that lucious blob into my mouth. Ah, the memories. When I saw that Kelly of Sounding My Barbaric Gulp had chosen Pumpkin Muffins, the wheels started turning. I made a low fat cream cheese mixture that included a bit or orange oil. Then I substituted organic white whole wheat flour for the AP flour, doubled the walnuts, and topped the muffins with pumpkin seeds and cinnamon sugar. Because I had a dark muffin tin, I turned down the oven temperature to 375 F, and placed the tin on a baking sheet to help keep the bottom from burning. So, were they as good as Picnics’ muffins? Nope, but they were tasty and relatively healthy, as far as Dorie recipes go. Sometimes I wonder if the memory of something is better than the original experience: By now, those Picnics muffins have reached the status of legend in my own mind! 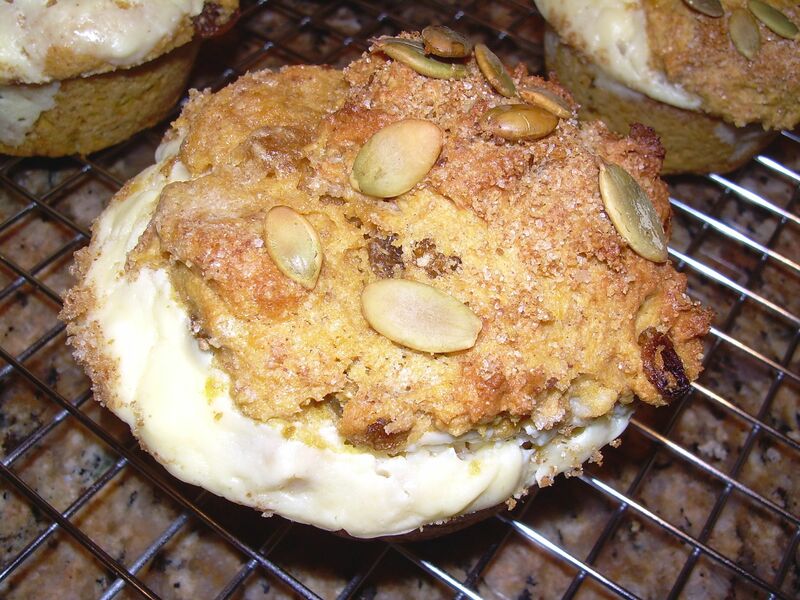 So, my search for perfect pumpkin cream cheese muffin continues. Thanks, Kelly, for a great choice this week. To see how others faired with their muffins this week, click on the blogger list over at TWD. Wonderful memory! We all need places like that in our lives. That’s a difficult question you ask about is the memory better than the original experience and I can’t answer that one. I do know there are somethings we really think we remember and they do seem to become bigger than life. Keep working the muffins, they may just happen. what a brilliant idea! i’m going to definitely try this, it sounds (and looks) amazing. OMW, these are truly decadent and I am so making them for the weekend…then you will have company in hell, because we are going to straight to hell with anything this sinfully wonderful. WOW…the combination is outstanding. Thanks for sharing…photos are wonderful…too wonderful! wow!! what a wonderful idea. they look sooo delicious 🙂 i am going to have to give it a try! That’s a great idea to pair the muffins with cream cheese! sounds delish! hi madam chow! would you mind telling me how you made your cream cheese filling? they look so delicious! Ohmygod. I love your pumpkin muffin cream cheese muffins. I bet they were amazing. Now I wanna make them again with cream cheese. Great job! I only have one word for these muffins. WOWIE!!! They look incredibly wonderful and sinfully delicious. I will be there with you and Kayte. Memories often are better than reality some times. I’ve gone back and made things I loved as a child and it just isn’t the same. Save the memories. Don’t go back. I love the twist! I’m sure the muffins were yummy! Holy Yum! What a great idea. Cream cheese filling. Were there ever three more delicious words? I love your take on the muffins. wow. That looks sooo good! Can I have one please?? Wow, those look yummy! I’ve got to try this recipe again with the cream cheese filling idea. And I like the cinnamon sugar on top as well–that will be a hit with my girls. I am liking all the tweaks you made. Pumpkin and cream cheese are always great together for some reason. That filling looks too good!! Have you tried Cook’s illustrated pumpkin nut bread recipe? It’s really good if you like your muffins dense, but light and full of flavour. I love your flavor combinations. And I’m sure the memory of eating them Hawaii makes them even more delicious.